Rachel is currently working as an assistant teacher in a preschool. I was told that I am one of the youngest volunteers in the Early Learning Programme (ELP). My journey as an ELP volunteer has been an enriching and enjoyable one. Volunteering for ELP has widely broadened my perspective of teaching and dealing with preschool children. When I first started out, I was really curious and worried how the children would act and behave as I knew that these children came from complicated family backgrounds. However, my worries washed away when I started teaching them. I was paired up with two adorable and lovely girls (which I am totally thankful and grateful for). Even though they were considered to be the weaker ones academically in the group, their enthusiasm and passion for learning never failed to bring a smile to my face. I was extremely determined to make sure that these two girls will benefit from these sessions so that they would be able to cope with school. Hence, whenever they managed to do and learn something new, I wanted to do even more for them. Throughout my volunteering journey, the only challenge I have had was to think of how and what I can do to help the girls better. 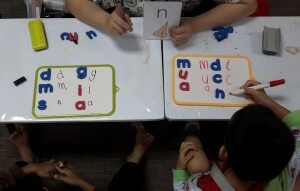 As they both have different learning styles, I had to customize the teaching so that both of them can benefit equally. Surprisingly, the girls quickly formed a bond with me, and were always asking for “Teacher Rachel”, even after the programme ended. All in all, I really had fun teaching the children. I too have actually learned quite a lot from them. If given the opportunity I would definitely continue to volunteer for ELP. Copyright © 2019 Economic Development Innovations Singapore Pte Ltd. All Rights Reserved. Students from disadvantaged families usually start behind their peers upon entry to Primary School due to their home situations. This could lead to lower self-esteem and loss of motivation to do well in school. Their school financial needs are usually covered by government subsidies, but they also need emotional support, regular motivation and nurturing. iShine started as a pilot programme in 2014 with Greendale Primary School. It now runs at Punggol Family Service Centre, under AMKFSC Community Services. iShine is a thematic, hands-on exploratory learning programme that takes primary school children beyond their school curriculum. Adult volunteers journey with the children throughout the year-long programme’s different themes, spotting hidden talents and newly sparked interests. In so doing, we raise the children’s confidence and encourage higher aspirations. iShine has a collection of 10 themes covering diverse topics ranging from cooking (Junior Masterchef), urban design (Design a City), to understanding different occupations (When I Grow Up). The sessions take place fortnightly and run for 3 hours per session. Children and volunteers participate in the activities in teams and discuss what they learn together. 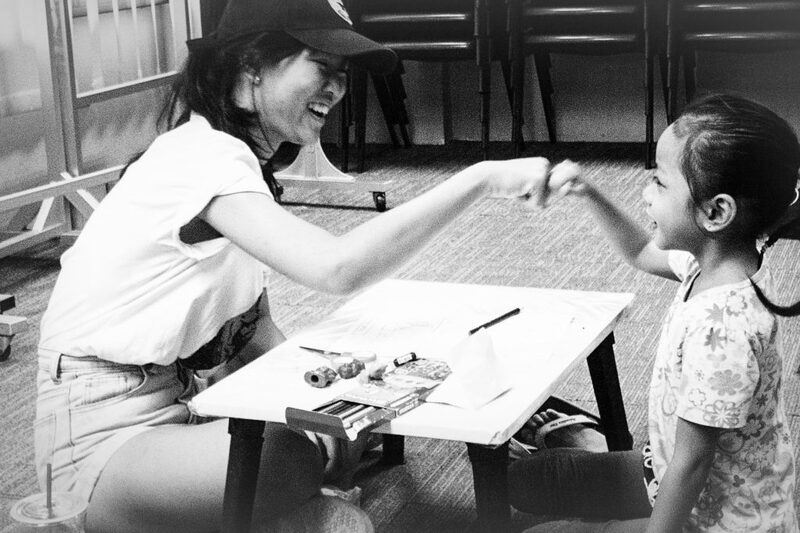 Punggol Family Service Centre, under AMKFSC Community Services, became the programme host for iShine in 2015. 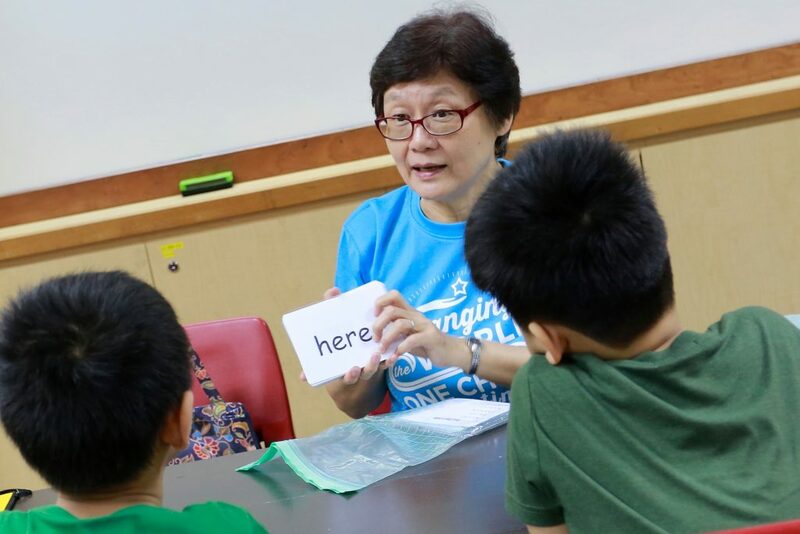 The FSC serves families living in Punggol through casework and counselling services as well as community support services for parents, children and couples. Punggol Family Service Centre has over 20 volunteer-befrienders in iShine 2017, with 11 in their 2nd, 3rd or 4th year. This theme was last conducted in 2016 and was conducted again in 2018. In 2016, we had 4 sessions under “Technology and You”. An Escape Room game was set up at Punggol Family Service Centre, under AMKFSC Community Services, with the help of volunteers from Singapore University for Technology and Design (SUTD)’s Rotaract Club. The participants imagined themselves in the year 2035. A rogue robot, Darth Evil, has arisen in Singapore and has threatened to take over the world with his brain-zapping machine. The children and volunteers, part of the ‘iShine Alliance’, had to complete missions in order to be released from a locked ‘control room’. At the end, the teams also worked together to deactivate the brain zapper and save the world. The activity gave the children a chance to handle technology toys like VR goggles, Little Bits and Circuit Stickers. The latter two were provided by our theme partner, Tinker Tanker. More importantly, each child also experienced the key message of the day, “I have responsibilities”. It was a very successful first session, with awed “wow”s, sincere “good job”s and victorious “we did it!”s heard from each room. 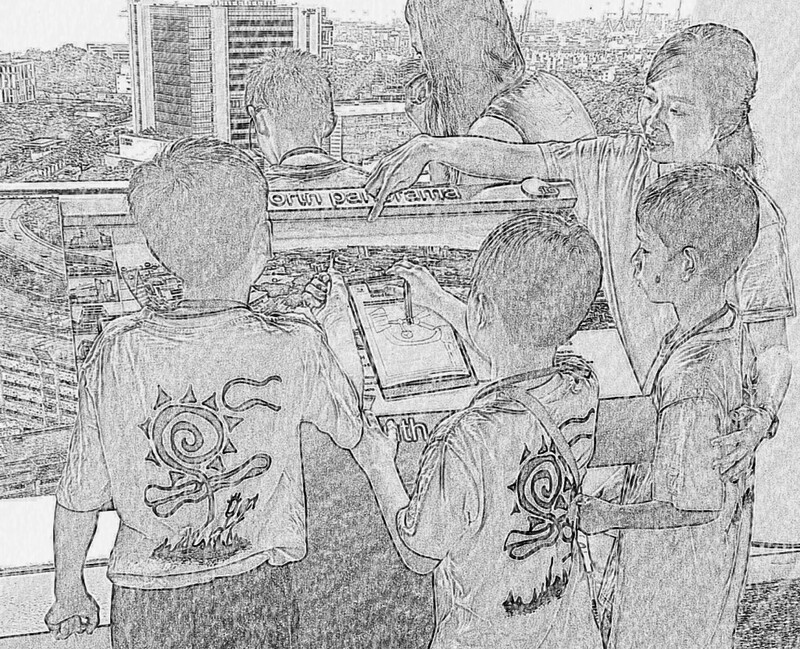 The fun continued in Session 2 where the children made 2 different tech games using software and hardware tools. The children that started with “software” coded their own games using Code.org’s platform. Then they switched to “hardware” where they assembled the earliest video game ever made, Pong, on an Arduino-based platform provided by Tinker Tanker. 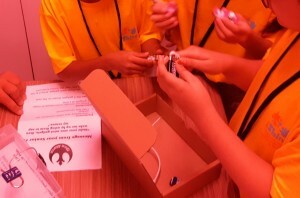 The idea of coding and assembling hardware had been daunting to some children (and volunteers!) initially but at the end of the session, everyone was proud to write down the key learning message for the day – “I can do it”. The teams moved out to the Singapore University of Technology and Design (SUTD). 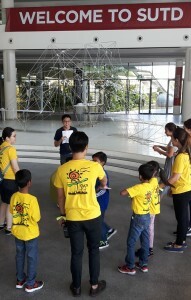 The SUTD Rotaract Club had designed a 4-station Amazing Race-style activity that saw the children and volunteers roaming the corridors of the University’s main teaching block. 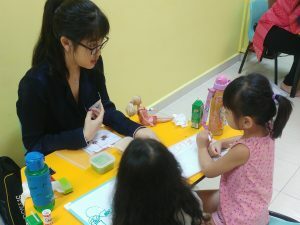 The children got to carry out hands-on activities in the classrooms and tutorial rooms that were the domain of SUTD undergraduates. The 4 stations covered 3D printing, making a solar-powered toy, folding a paper Super Mario turnstile and learning the importance of communicating ideas through a charades game. The participants had lunch at the student canteen, then the children completed their journals with the key message “I can perform”. It was the first time any of the children got to spend time in a university, and an impression was made on at least one child who was heard shouting “next time I want to school here!”. For the final session, the teams built their own robot using Lego Mindstorms in a session led by Yama Min, CEO and Founder of In3Labs, a technology education company. Yama caught everyone’s attention with a video on Honda’s Asimo robot, and another on the power of Lego Mindstorms. The children were then guided to build a 3-wheeled robot, with a touch sensor, that would stop when it hit a barrier. 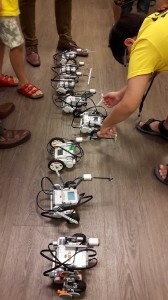 For the grand finale, all the robots were lined up for a race across the training room. In the ensuing chaos, no one was sure which robot won, but there was a lot of cheering and clapping nonetheless. The children noted the key message for the day “I can do more in a team”. The ELP is an intervention-based, volunteer-championed literacy and numeracy programme. It started as a pilot in 2014 at Care Corner FSC* (Queenstown) for 16 six-year olds living in the vicinity. They came from low-income, multi-challenged families that did not speak English at home. Despite attending preschool, the children had not yet mastered basic literacy and numeracy. Several had learning difficulties and all of them needed more individual attention and tailored learning. We realized that if no intervention had been provided, many of these children would have fallen behind their peers when they entered Primary School. Through the years, the ELP was iteratively improved and extended to multiple charities, thanks to generous donor support. It has touched the lives of over 170 children since inception. The ELP’s in-house curriculum was developed with support from Literacy Therapist Sharon Yeoh and Educational Psychologist Adeline Chin. It comprises a balanced literacy programme that uses an Orton-Gillingham approach as well as manipulative-heavy Numeracy activities. Children are tested at baseline, mid-term and year-end to determine their needs and progress. Volunteers are matched to children on a maximum 1 volunteer : 2 children ratio, and lesson plan for their students based on their knowledge gaps and preferred learning styles. Children that display signs of learning or other difficulties are referred to our volunteer Speech Therapist, Occupational Therapist or/and consulting Literacy Therapist and Educational Psychologist for screening and assessments. Children are bused to a host charity every Saturday morning and provided with breakfast. Lesson starts with a group teaching session, followed by one-hour solo lessons involving multi-sensory exercises, tools and reading books selected to match the child’s level and progress. The children then have 45 minutes of Group Play aimed at developing their social interaction and gross motor skills. In 2018, we partnered with National Library Board to incorporate their KidsRead programme into the Group Play period. We include gym, music and other activities through our corporate partner providers. The children also go for outings and have in-house mini carnivals. In 2017, we partnered with Prison Fellowship Singapore, Beyond Social Services and a shelter to provide ELP to the children they support. In 2018 and 2019, we partnered/are partnering Prison Fellowship Singapore, Beyond Social Services and FaithActs. 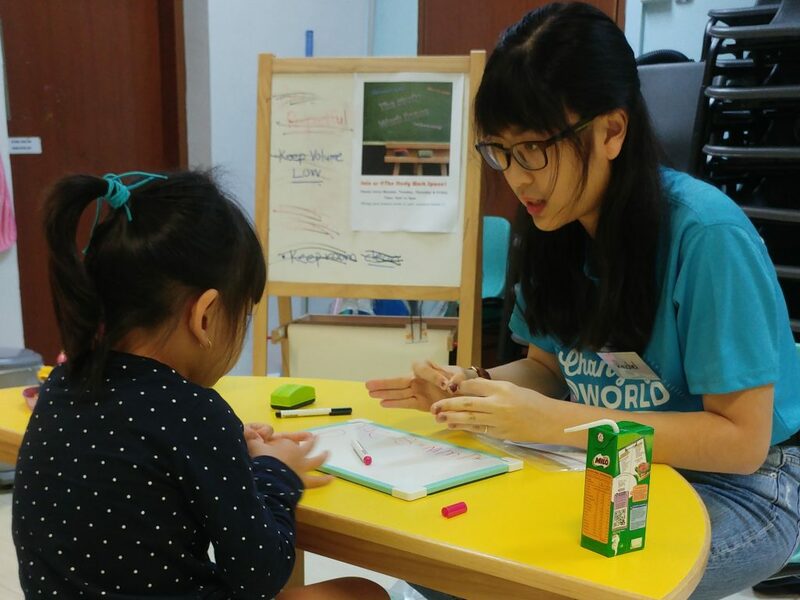 Four companies, Edmund Tie & Company, MyGym@Buona Vista, Mangrove Learning and So Yoga also gladly came forward in 2018 to provide the children with meaningful and exciting activities. Visit our Facebook page for week to week updates! Care Corner Family Service Centre (Queenstown) was our pioneer ELP site and have been a great partner since 2014. In 2017, ELP expanded to Prison Fellowship Singapore‘s Care Club, Beyond Social Services‘ Healthy Start Child Development Centre and Singapore Anglican Community Services‘ Family Care Centre. In 2018, ELP is running at 5 sites through Beyond Social Services, Prison Fellowship Singapore and FaithActs. 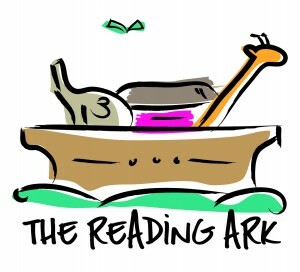 Sharon Yeoh, is a literacy therapist who has her own private practice, The Reading Ark. She was an ex-MOE teacher and hence understands the primary school English curriculum. She has an International Teaching Diploma in Dyslexia and Literacy from Dyslexia Action UK, and works individually with children with a range of learning difficulties including dyslexia and ADHD. Her experience includes teaching children in pre-school to the primary years. Sharon is our main literacy consultant for the ELP and is our partner in the development of the programme’s literacy curriculum, teaching tools and materials and conduct of volunteer training. Adeline Chin is an Educational Psychologist, supervisor and Triple P parenting facilitator in private practice. She is a Registered Psychologist of Singapore Registered Psychologists, International Affiliate Member of the Australian Psychological Society, and Full Member of the International Association of Applied Psychology (US). She assesses and intervenes with children and adolescents that have developmental and learning issues such as autism, ADHD, dyslexia and overall underachievement. She has 20 years of experience working with parents, teachers, children and adolescents in various settings, such as special, mainstream and international schools, Voluntary Welfare Organisations, Boys’, Girls’, and Children’s Homes, hospitals as well as private centres. 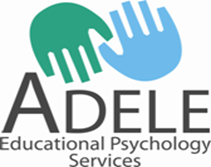 Adeline is our consultant Educational Psychologist for the ELP. She advised us our curriculum, assessments as well screening checklists. She also screens and assesses ELP participants who display persistent signs of learning difficulties throughout our 10-month programme. We have been blessed to have many volunteers that started their first volunteering experience with ELP and continued with the programme beyond their first year. For example, we had 28 volunteers in ELP 2016 with 18 continuing from ELP 2015 and amongst these, 14 were from ELP 2014. In ELP 2017, we had around 50 volunteers across 4 sites. It rose to 69 volunteers across 5 sites in ELP 2018. These dynamic, enthusiastic and committed volunteers range in age from 16 up and include working adults as well as tertiary students. We also have siblings, cousins and couples volunteering together. Furthermore, more and more of them are on their 2nd year and beyond, providing much needed long-term support for these children and seeing ELP expand and grow. 2. Elizabeth, who works as a School Counselor and is volunteering at ELP@Prison Fellowship Singapore. ELP 2018 - Status Updates! In 2017, ELP was launched in 4 centres – a Family Service Centre, a Childcare Centre, a Prison’s Outreach as well as a Shelter for homeless women and children. We learnt about the different types of charities in Singapore we could partner with, and how we could try to expand the ELP’s reach sustainably. We refined our training sessions, streamlined Literacy and Numeracy teaching tools, and put in place structure and processes for each site. A pilot Mother’s English Literacy Programme was also trialed at the shelter. 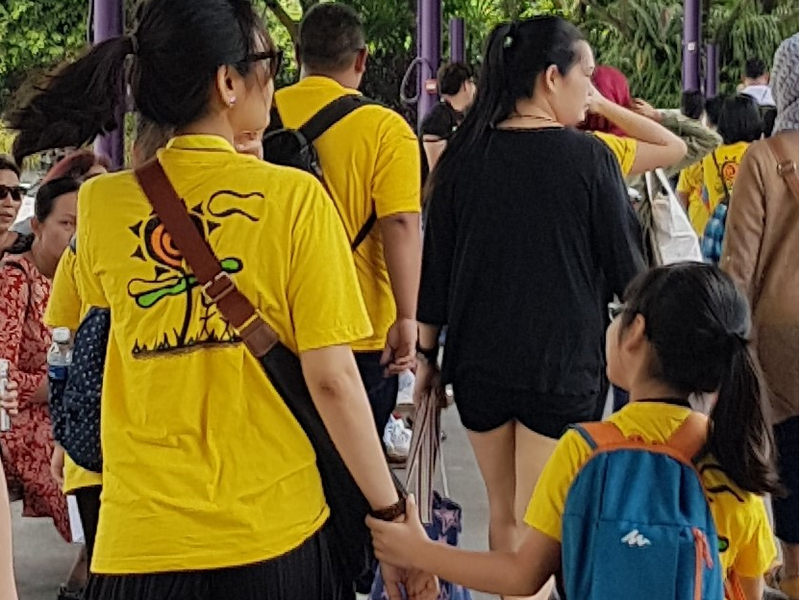 In 2018, 3 charities (Beyond Social Services, FaithActs and Prison Fellowship Singapore) are running ELP, across 3 sites. We are also piloting a more advanced programme (ELP+) in partnership with FaithActs and New Town Primary School to support students in Primary 2. Do check out our Facebook page for latest updates. Should you wish to join any of our programmes, do click on the red “Volunteer” button to sign-up! 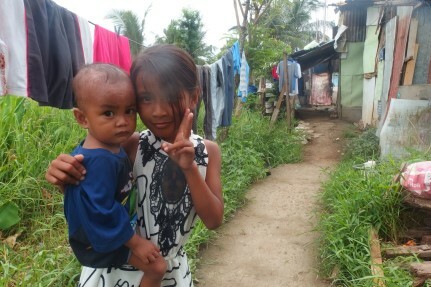 Parents of poor and needy families struggle to work, take care of their children and provide for their basic needs. Some of these families receive regular food rations for daily sustenance and can scarcely afford diapers and milk powder for their children. Many such mothers are malnourished themselves or are medically unwell, and so are unable to breastfeed their children. We started our first “Milk and Diapers” pilot with Care Corner Family Service Center (Queenstown) from March 2014- March 2015. During this period, a monthly donation of milk powder and diapers were provided to the neediest families in the community served by the Centre. These donations were provided for 3-6 months, with extensions approved on a case by case basis for up to a maximum of 12 months total support. Care Corner FSC (Queenstown) set-up detailed processes for social workers to nominate needy families, keep track of duration of support and formally extend support for families that needed it. Each month, our donations benefited about 60 children – they were aged 3 and below, or were older than 3 but suffer from chronic diseases like cerebral palsy. 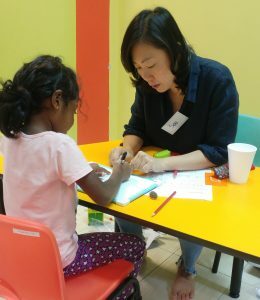 A volunteer-based, multi-module nutritional education programme was also developed in partnership with A*STAR’s Singapore Institute for Clinical Sciences to educate the families on how they could feed themselves and their children healthily, even on a limited budget. The Milk and Diapers pilot successfully ran for one year from March 2014 – March 2015, and was transitioned to another corporate sponsor, Zendesk. In 2017, we started a project with Babes, a charity that supports teenage parents, and Society of St Vincent de Paul (SVDP), a Catholic society which had its own Milk and Diapers programme. Babes set up processes for nominating infants for support, as well as purchasing and distributing milk powder and diapers. The volunteers not only delivered the items to the teenage parents each month, they also monitored the growth of the babies and provide emotional support to the caregivers. By working together, we learnt about the challenges faced by this group of parents, their aspirations and their needs. Babes evolved this project into a full fledged programme called “Happy Stork” which is open to donor support. Care Corner Family Service Centre (Queenstown) was our pilot Milk and Diapers partner in 2014-2015. Babes and Society of St Vincent de Paul worked with us in 2017. 1. This website (“EDIS Website“) is provided to you by Economic Development Innovations Singapore Pte. Ltd. (“EDIS“) on the following terms and conditions (“Terms and Conditions“). By accessing any page on this EDIS Website, you agree to be bound by these Terms and Conditions. 5. The Personal Data collected may include your name, address, e-mail address, contact number and/or photograph. We will do our best to ensure that the Personal Data that we collect is accurate. However, we do encourage you to provide us with an update of any change in your Personal Data as soon as possible. 6. EDIS will endeavour to obtain your express consent to collect, use and disclose your Personal Data prior to or at the time we collect it. However, in certain situations, you will be deemed to have consented to the provision of your Personal Data, e.g. where you provide your Personal Data voluntarily. 7. You may at any time give us reasonable written notice of the withdrawal of your consent to collect, use or disclose your Personal Data. Within a reasonable time after we receive the notice of withdrawal of your consent, we will inform you of the consequences of your withdrawal of consent and when it will take effect. 8. EDIS anonymously tracks your visit in order to compile statistical information about the use of EDIS website. We do not collect individual information about you when you use the website unless expressly provided by you. e. to publicise events and activities of EDIS Cares on EDIS’ s website and publications. 10. Your Personal Data may be transferred to, stored by and / or processed by a party within or outside of Singapore to provide a product or service you have requested or for any of the Purposes. c. takes appropriate measures to ensure such compliance by implementing the necessary data protection and appropriate technical and organisational measures. 12. You can view your Personal Data which we have collected and stored at any time. In order to do so, you will need to submit a written request for access. We will respond to your request as soon as possible and, at the latest, within 30 days of receipt of your request. 13. Your right to view your Personal Data is limited to your Personal Data only. EDIS is not permitted to reveal any Personal Data about any other individual to you. We reserve the right to refuse access to your Personal Data if it will reveal or lead to the revelation of another individual’s Personal Data, cause harm to you or another individual or is contrary to the national interest. 14. You can submit a written request to correct your Personal Data which we have collected and stored. We will consider your request and respond to it as soon as possible and, at the latest, within 30 days of receipt of your request. We will make the necessary corrections as soon as reasonably practicable provided we are satisfied that the corrections should be made. In the event that we feel the corrections should not be made, we will inform you. f. Devising procedures that will be implemented in the event of a breach of security. 16. EDIS will retain your Personal Data for as long as the purpose for which your Personal Data was collected is still being served and as long as it is necessary for legal or business purposes.